While doctrinally the Russian Orthodox Church and the Roman Catholic Church remain far apart, in confronting the challenges of modernity, there are many places where the two can work together. 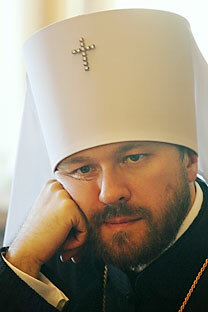 The Russian Orthodox Church and the Roman Catholic Church should accept each other not as rivals, but first and foremost as allies, working to protect the rights of Christians, said Metropolitan Hilarion of Volokolamsk, head of the ROC’s Department for External Church Relations in a speech at an international meeting of Christians in Wurzburg, Germany. "The future of Christianity in the third millennium depends on the joint efforts of the Orthodox believers and Catholics,’’ Hilarion said. “The idea of a strategic alliance with the Catholics is an old idea of mine. It came to me when the Catholics were electing the new Pope. Although I would like to point out that what I am suggesting is, in essence, the direct opposite of Uniatism, which is a way toward a rapprochement based on doctrinal compromises. In our point of view, the policy of Uniatism had suffered complete failure. Not only did it not bring the Orthodox Christians and Catholics closer together, it actually distanced them. And Uniatism, as is currently recognized by both Orthodox believers and Catholics, is not the path toward unity. ‘‘I, on the other hand, am asking us to act as allies, without being a single Church, without having a single administrative system or common liturgy, and while maintaining the differences on the points in which we differ. ‘’This is especially important in light of the common challenges that face both Orthodox and Catholic Christians. These are first and foremost the challenges of a godless world, which is equally hostile today to Orthodox believers and Catholics, the challenge of the aggressive Islamic movement, the challenge of moral corruption, family decay, the abandonment by many people in traditionally Christian countries of the traditional family structure, liberalism in theology and morals, which is eroding the Christian community from within. We can respond to these, and a number of other challenges, together. ‘’I would like to stress, once more, that there are well-known doctrinal differences between the Orthodox and Catholic faiths, but there are also common positions in regard to morality and social issues that today are not shared by many of the representatives of liberal Protestantism. Therefore, cooperation is first and foremost necessary between the Orthodox and Catholic Christians – and that is what I call a strategic alliance. ‘’The Church is not ready to make any compromises, and I am not calling for compromise, but on the contrary, to uncompromisingly defend our positions. Within the framework of the Commission for Theological Dialogue between the Catholic Church and the Orthodox Church, my position is often the toughest. Meanwhile, the documents that are drafted there, are the most often contested by the ROC delegations. There have been instances when we were forced to walk out of sessions as a sign of disagreement with what was happening. We always very firmly oppose attempts to erode the differences that exist between us. ‘’We don’t need compromises. We need cooperation and collaboration. And within the framework of the theological commission, we could discuss the differences that exist between us not in order to find a compromise, but in order to clarify our differences and the things we have in common. It could so happen that in the course of discussion we realize that in some doctrinal aspects we are actually closer than seemed to be before – and this will be a rapprochement. But just the opposite could happen: we may see the differences that we have never noticed before. This article was translated by RT TV. The original English version can be found here. The original Russian version can be found here.